The LNG journal, the industry choice of magazine for LNG provides analysis and news, from technology options in the engineering sector to LNG shipping projects and financing. It is published in print, with also a weekly emailed newsletter to subscribers. For advertisers the LNG journal provides a unique opportunity to reach a diverse range of senior and influental industry players through a number of mediums including print, web and e-newsletter formats. LNG journal print media pack is now available for download. 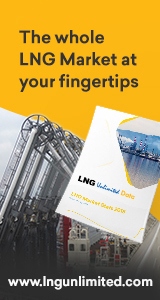 LNG journal digital media pack is now available for download. LNG Shipping Review media pack is now available for download.